HOW COOL IS THIS! we was headed to our show la..
we was headed to our show last night and i received this AMAZING newspaper clipping from Shirley Svoboda - mother of our AWESOME FAN Anthony Svoboda we met at a show in Oberlin, KS. Anthony had never been to see a Live Band perform and RIDICULAS TRIXX was his first! 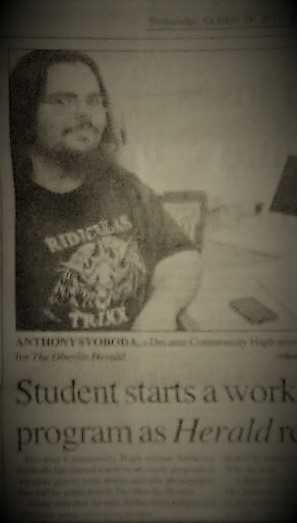 Anthony, RIDICULAS TRIXX would like to CONGRATULATE YOU for starting this Wonderful work shop program in your hometown and becoming an Oberlin Reporter for your hometown Newspaper! We would also like to say a HUGE THANK YOU for all of your love and support for us-follow your dreams/KEEP RAWKIN!